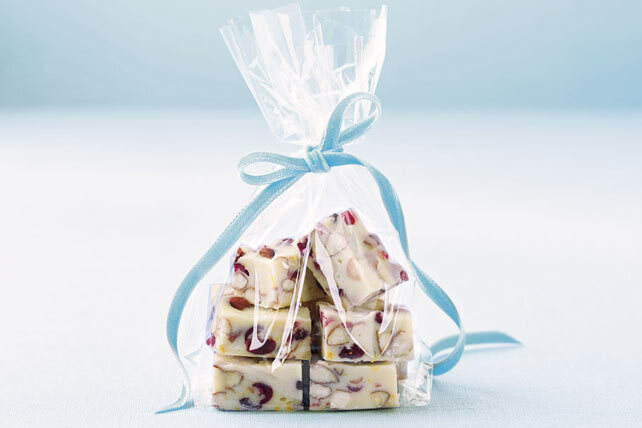 Our festive fudge is studded with toasted almonds and sweet-tart cranberries. Get your Christmas gift-giving all wrapped up with this White Chocolate Fudge. Line 8-inch square pan with foil, with ends of foil extending over sides. Microwave chocolate and milk in large microwaveable bowl on MEDIUM 2 to 3 min. or until chocolate is almost melted; stir until completely melted. Stir in nuts, cranberries and zest. Spread onto bottom of prepared pan. Refrigerate 2 hours or until firm. 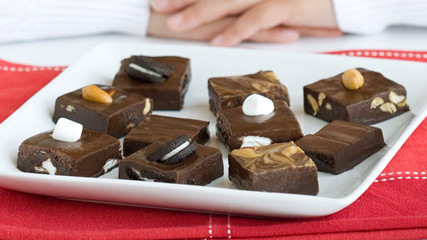 Use foil handles to lift fudge from pan before cutting to serve. Prepare as directed, substituting 1 cup chopped toasted pecans for the almonds, and 1/2 cup each chopped red and green candied cherries for the cranberries. This fudge makes a great treat for teachers. Don't forget to include a copy of the recipe with your gift!